Lloyds are honoured to be auctioning this prestigious collection that will have over 150 vehicles go under the hammer at Gosford Classic Car Museum’s enormous facilities on the 6th and 7th April 2019. Although the Gosford Classic Car Museum attracted in excess of 10,000 monthly visitors to the collection, irreconcilable differences with the tax office meant the museum was “left with no alternative but to close its doors”. Former Formula One World Champion and Auction Ambassador, Alan Jones has a great passion for European classics and is one of this collection’s biggest fans. “This collection is one never to be forgotten, it is extremely special and admired by many collectors and enthusiasts across the globe, including myself”. This is a rare opportunity to see this magnificent collection of classics by iconic names such as Ferrari, Lamborghini, Aston Martin, Bentley, Maserati, Porsche, Rolls Royce, Land Rover, Chrysler, Holden and Ford. Would you like to receive information about our Classic Car auctions and events? GTHO Phase III 'BIG RED' Breaks Million Dollar Record! 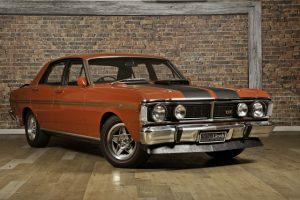 The GTHO Phase III is the holy grail of Aussie Fords with a reputation born on the racetrack and bred on the streets. One of those custodians was legendary Australian fast bowler Jeff Thomson who owned the car for nearly a decade, during which time it gained the nickname ‘Big Red’, which is what the car has been known as ever since. Highlights of the Torana A9X GMP&A at this spectacular event held on 16th June! Chat with a Lloyds Classic Car Curator today. Lloyds are proud to bring both buyers and sellers of Australia’s greatest collector cars together in a unique auction event. Attend our LIVE Auctions in person, or watch the online simulcast to witness Australian record prices and be a part of history. Porsche, BMW’s, Mustangs and more! ‘The King’s Garage‘ collection of rare race cars included a one-of-one Brabham BT21B Cosworth open wheel race car with an exceedingly rare Cosworth SCB four-cylinder engine (of which there are believed to be only two or three in existence), fuel bowsers, engines and parts. There’s nothing quite like the appeal of a classic car. And, when it comes to classic car sales Lloyd’s Auctions offer some of the rarest and most desirable collectable cars for sale in Australia. So, if you’re in the market to buy classic cars and appreciate the beauty and craftsmanship that only collector cars can provide, you are going to love what we have for sale here at Lloyd’s Auctions on the Gold Coast. What’s your favourite classic car? Does it scream muscle or more class? Is it all screeching tyres and pedal to the metal? Or, is it horsepower that gets your engine starting? Aussie car lovers seem to be separated under a general divide: Holden or Ford. Which team are you? Wherever your loyalties lie we supply both classic Holden cars for sale and classic Fords cars to buy. Our Australian car auctions also regularly feature classic Utes for sale. Let’s get your petrol glands salivating. Here’s a list of some of the phenomenal rides that come under our hammer: Rolls Royce Silver Cloud; LJ GTR Torana; 1963 Austin Healey; 66 Fastback Falcon; Model T Roadster Ford; 1966 Lincoln Continental; 1975 Chrysler New Yorker. We auction Lamborghini’s, Bentley’s, Corvette’s, Cobra’s, Mini Cooper’s, Blue Meanies and Pickup trucks. And, that’s by no means an exhaustive list. The benefit of our Australian car auctions is you never know just what you could find! I’m betting there is a car you’ve always seen yourself owning, that you’ve fantasised about? Or, are you a seasoned buyer of collector cars? In that case, we offer some of the scarcest finds. Whoever you are and whatever your looking for if you appreciate rare collectable cars then Lloyds Auctions may just have what you are searching for in our next online car auction. If you’re looking to buy a car for investment, then don’t put your foot on the brakes… Life is fast and furious – drive your dream today!